1. All quotes are valid for the period stated on the quotation. 2. Strongguard shall have the right to withdraw the offer made in this quotation at any time prior to its acceptance by the client. 3. The price in the final quote may vary from the original request if there are any price or product changes requested by the customers. Strongguard reserves the right to alter product and prices in the quote, as long as the quote has not been confirmed with the customer. 6. In the event that products in the quote are subjected to any price and supply fluctuation that is outside of our control we reserve the right to update the price and product in the quote accordingly. 7. If a product has undergone a price drop or a price increase, the quote will then be adjusted accordingly. If there is a product that is no longer available, the product will then be replaced or substituted based on customer’s request and is subject to their final approval. 8. Any discounts given on the quote are usually worked out based on the overall quote amount, if there’s any significant changes to the overall quote amount or items, the discount may also be changed to reflect it. 9. If a supplier requires and an upfront payment or a deposit for samples or products these charges will be deemed to be paid for by the owner. 10. Strongguard warrants that the work will be carried out in accordance with all relevant laws and legal requirements. 11. Strongguard warrants that work will be carried out in an appropriate and skilful way and with reasonable care and skill. 10. Strongguard assumes no obligation whatsoever for disruption or delay of delivery resulting directly or indirectly from the occurrence of any contingency beyond its reasonable control whether caused by the forces of nature, people, or governments. 12. The Owner, must not obstruct, interfere with or hinder the carrying out of the Works. The Owner must take all reasonable steps to prevent all others from obstructing, interfering with or hindering the carrying out of the Works. b. Provide Strongguard with the Property Manager and/or tenant’s contact details. 15. Either party may give to the other a written notice requesting a variation to the Works. 16. 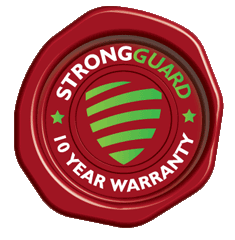 Strongguard may at its discretion, agree to carry out any variation requested by the Owner. 17. The parties may agree to vary the Works by adding or omitting work from the Works. 18. Strongguard must ensure that the parties’ agreement to vary the Works is put in writing in a variation document signed by Strongguard and the Owner within the shortest practicable time and before any work, the subject of the variation, is carried out.